Confused about how Medicare Advantage Health Plan and Medigap differ? When it comes to Medigap versus Medicare Advantage plans, which one wins? While they are relatively easy to understand, the complexities lie in the details. Finding the better one for you may not seem easy. Medigap is a term that means Medicare Supplement Insurance. It's kind of like my name is Katherine but everyone calls me Kathe (pronounced the same as Cathy). Medicare Supplement Plans fill in the gap of original Medicare, they don't replace it. On the other hand, if you have the Medicare Advantage plan, you have replaced your plan. Because of this you can't have both, because Medigap plans don't work with Medicare Advantage. We have discussed about it in detail here. Medicare Advantage Plans only work within their own coverage area. For example, if you live in San Diego, CA, you probably won't be able to use your plan in Orange, CA, because these two cities are in different coverage areas. They are in different counties in California. If you have an emergency, you will be covered for that, but you likely won't be able to, for example, schedule an appointment to see a dermatologist while traveling. While certain plans might have exceptions to this, it is generally the case. Because of this, if you travel frequently, Medigap plans might work better for you versus Medicare Advantage Plans . On the other hand, in California there are several Medicare Advantage Plans that offer zero premium. (I can't say the word “free” because even if the company isn't charging you a premium for your Medicare Advantage – you'll still have to pay the Part B premium.) Most people pay $134 per month in 2018, but you could be paying more or less. Depending on the Medigap Plan you have, your plan could cover all the copays coinsurance, and deductibles of Medicare. Or you could have a copay when you see the doctor. There are several different types of Medigap plans which are standardized. Their coverage is based on the Plan's “letter” and is the same coverage no matter which company offers it. So it's easy to compare policies when you are working with Medigap plans. Medicare Advantage on the other hand, covers things differently versus Medigap. Most Medicare Advantage Plans will have copays to see the doctor, hospital, etc. There will normally be co-insurance amounts for expensive procedures such as chemotherapy. However, all Medicare Advantage Plans must have a Maximum Out Of Pocket for medical services. In 2018 the maximum out of pocket was $6700 if you were on an HMO, and $10,000 if you were on a PPO. This limits your liablity if you get an expensive condition such as cancer. Most Medicare Advantage Plans (but not all) include medications. Medigap plans on the market today do not include medications. So if you have a Medigap Plan you'll need to purchase a stand-alone prescription drug plan (PDP). If you have an MA plan that doesn't include drugs, it's important to note that you CANNOT purchase a PDP. If you do, then your MA plan will be canceled! Medigap might have 10 different types (according to their “letter”) but many offer the same benefits based on their letter. So, they are easy to compare. However, the terms and conditions of Medicare Advantage plan change based on the company and the service area. Some companies offer multiple plans in the same area, all with different features. This can make MAPD a bit confusing, and difficult to compare. However, the Medicare.gov website has a tool that helps you compare plans based on copays, coinsurance, maximum out of pocket, etc. The issue is that with Medicare Advantage Plans you must stay in network, and the official Medicare website doesn't give you tools to see if your doctor is in network. So you must either go to the website of each individual company you are considering, call the individual company you are considering, or use a broker who will do this for you. With Medigap you don't need to get your procedures pre-authorized by an insurance company. 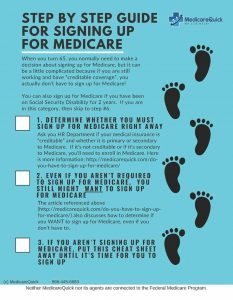 If it's a procedure that Medicare covers you can get your procedure if it's medically necessary. But you will get paperwork after you see a provider (ie doctor). This is because the provder submits the bill to Medicare and then once Medicare pays the bill, the Medigap pays it's share. Then both Medicare and the insurance company send you paperwork to tell you what was paid and what wasn't. So there isn't any arguing with the insurance company to get your bill paid. If Medicare pays, the Medigap pays their share. Period. Medicare Advantage works differently. If you have a procedure in mind your doctor must get that procedure pre-authorized (in many cases). Even if it's a procedure that is covered by Medicare, the insurance company might not authorize it, or might authorize it on a limited basis. For example, if you need home health care, your home health care agency might recommend 14 visits, but the insurance company might only authorize 3 visits. I hear this all the time from home health care agencies in my area. The decision to go with a plan is a personal one. What's right for your neighbor, spouse, or friend might not be right for you. Medigap plans tend to cost more on a monthly basis due to their premium versus Medicare Advantage. So if you are on a tight budget, and understand the limitations that Medicare Advantage places on their members, it might be the right plan for you. Or if you have the budget to pay the Medigap premiums, and flexibility is a must, then Medigap might be the plan that's right for you. So when it comes to Medicare Advantage versus Medigap, it's really a personal choice. Which one will be right for you? Let me know! And, don't forget, I can help you actually enroll in the plan that's right for you. Give us a call at 866-445-6683 or contact us today.